Hello! 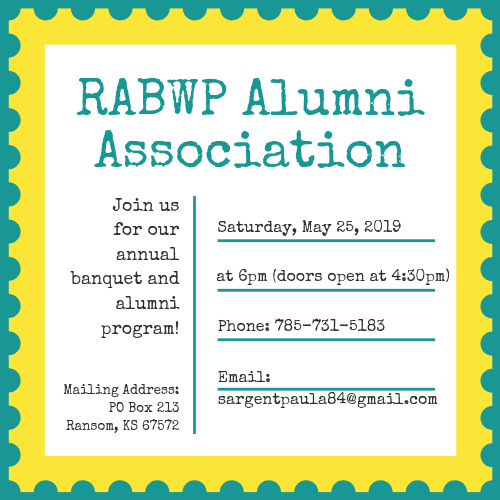 It is that time once again for the annual Ransom-Arnold-Brownell-Western Plains High School Reunion Banquet which will be held on Saturday, May 25, 2019. This year the reunion classes of 1939, 1949, 1959, 1969, 1979, 1989, 1999, and 2009 will be honored. Do not miss the opportunity to reminisce. Come and welcome the graduates of 2019. We realize that sometimes addresses don’t get updated as needed and that moving can disrupt mail. So we are putting this on our website for those of you who do not receive an annual notice or haven’t received one in some time. A printable notice can be downloaded here, and you can send in the bottom portion for corrections, if you wish to attend the banquet, or just for dues. You can also visit our Membership Information Form and update your information there. If you know of another alumni not receiving notices please direct them to this website as well. This website will save our alumni association a great deal of postage and an appreciable amount of time. We are hoping that you will be able to join us for the banquet. Reservations are $20.00 per plate again this year which includes dinner, dues and a booklet. However, we understand that there are reasons that make it impossible to travel back but you can still receive the alumni booklet by sending your dues for the same amount ($20.00). We also are extremely grateful to those who bless the association with their donation gift. Again, the reunion will be May 25, 2019, at Western Plains High School, 100 School Street, at Ransom. Doors will open at 4:30 pm for visiting and dinner will begin at 6:00 pm. We thank you for helping to make this year’s reunion a big success by sending us your information soon.